My journey with Coco-Luxe began with a small tragedy that reminds me of a Bill Murray skit on Saturday Night Live. In the skit, Bill Murray plays an recently fired and disgruntled grocery bagger who thinks that bags should be packed "hard things on top, soft things on bottom." Sadly, my postman has similar logic. For example, if a package is marked This Side Up, it appears on our porch upside down. If it is marked Fragile, it is crushed, perhaps with a tire tread on it. He also likes to give me the mail of another household with the same number but a different street and them mine. When questioned about any of this, he becomes very defensive. While I do hold on to my belief that there is a large purple ape in the Monrovia post office that helps crush packages, in general I think this postman's decisions just feel right to him. So when he delivered my precious box of Coco-Luxe, despite my having asked him in advance to leave packages in the shad, he left it in the full sun. Thus some of the Coco-Luxe chocolates were a little melted--not that it affected the taste! 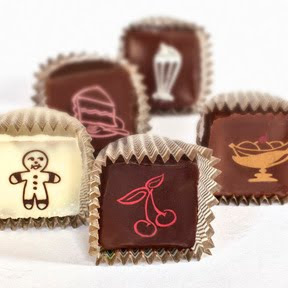 Whereas I am not so sure about my postman's concepts, I am a big supporter of Coco-Luxe's concept that if you put two great things together -- chocolate and classic sweets--the winning combination becomes even greater than the sum of its parts. Because we're the kind of people who like to bite the head off the bunny first, we decided to start with the truffle with the Gingerbread Man on it. I happen to be a sucker for anything gingerbread, so this truffle had my name all over it. Rich and creamy with a nice gingerbready (this new adjective is my contribution to the American vernacular) taste. After some debate, we decided to try the Devil's Food next. We were curious. Would it taste just like a chocolate? Or would it really taste like a chocolate cake? Well, we were delighted to find it was definitely cake-like in taste and texture. The next set of chocolates were devoured in quick succession and with less philosophical discussion: the Double Cherry was surprisingly piquant, sweet and a little tart just like a cherry should be, only better because it had chocolate and the German Chocolate truffle was a perfect blend of chocolate and coconut, with just the right amount of toasted pecans thrown in for a little texture. If you've ever dreamed of a Malted Shake that is in the form of a truffle, you must have a Malted Milk. 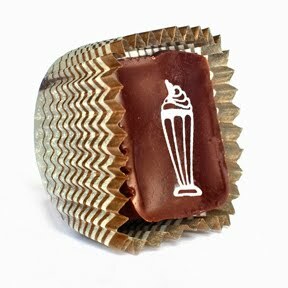 And, if you are an Angel Food cake fan, Coco-luxe offers a chocolate ganache infused with a heavenly amount of vanilla bean. We also loved the After Dinner Mint too. We felt that if the After Dinner Mint truffle were a person, he/she would be serious (after all it's dark chocolate) but when you got to know them better you'd would find them to have a light, minty and refreshing personality. Our favorites were the Banana Split and Dreamy Orange. The Banana split had a banana ganache with tiny bits of dried cherries, which for some reason, made it really taste like a Banana Split. After you taste the truffle you think, why isn't Banana Split a more popular flavor? It almost feels un-American not to like it if you ask me. When I bit into the Dreamy Orange, I felt it was aptly named. It flooded me with memories of those hot summer days when by some miracle you found yourself with a Creamsicle in your hand, that you didn't have to share, and it didn't matter that it would drip all over you. Imagine the feeling, make it taste better, add chocolate and you have the Dreamy Orange. 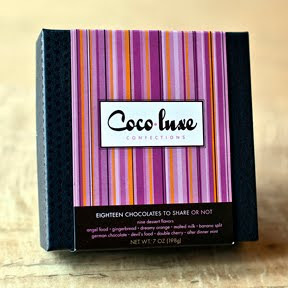 Coco-Luxe also has sensational chocolate covered caramels, chocolate bars, chocolate covered nuts, hot cocoa and seasonal confections. I completed my Oliver Kita journey with his Palet d'Argent, a Venezuelan Chocolate; the Palet D'Or, which is a blend of milk and dark chocolate and Oliver Kita's signature chocolate and the Palet D'Olivier, an extraordinary chocolate with a hint of fruit and wine that makes you think of twinkly stars, balmy nights and romance in the air. Each of these chocolates, less complex than his other truffles was effortlessly sublime. Like any great master, Oliver Kita can astonish us with his virtuosity and then silence us by making the simplest things genius. There is a certain satisfaction in knowing you've had the "best of" something. However the best most of us can do is live vicariously through what we see on TV, in the movies or Oprah Winfrey. The champagnes, fancy cars and diamonds are a just a fantasy, especially in this economy! But there is a "best of" that is affordable, to anyone who can spare a few dollars, for one, a few or a whole box of the world's best chocolates at CocoaBella Chocolates. Like any great institution, CocoaBella Chocolates makes it easy for both the novice and expert chocoholic as they have already done the hard work for you. That is, if you consider scouring the earth for the world's finest chocolatiers and then presenting them to you so you can select from their chocolates at your leisure to be hard work. 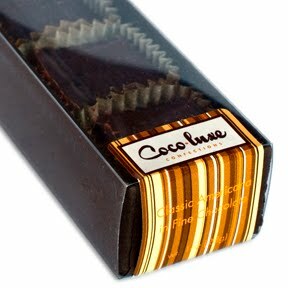 CocoaBella Chocolates hail from Belgium, Switzerland, France, Italy, and Spain and include fine American Chocolatiers as well. When you walk into the store you are greeted with a mesmerizing array of little chocolate armies, all organized neatly in rows by chocolatier. There are interesting descriptions of each chocolatier, followed by individual chocolate descriptions, all of which you feel compelled to read while trying not to fog the glass case or drool unbecomingly. Sadly, after browsing the selection you find yourself in the position of having to choose just a few chocolates when what you really want to do is be a complete glutton and eat everything in sight. When you are making your selections, the vendeuse (I had to say that) places the chocolates on a little silver tray which, to me makes it extra special. There is no minimum but I didn't think to ask about the maximum. Honestly, it would be my dream one day to say "just pack up the whole store for me." On this excursion we decided to try chocolates we hadn't tried before. Our selections included: Apple Brandy, a chocolate with apple caramel, Apple and Brandy; sesame nougat, dark chocolate and caramelized Sesame Seeds; Maple Caramel, maple syrup infused caramel enrobed in dark chocolate; Peanut Butter and Jelly, strawberry jam with peanut butter in milk chocolate; and a spicy Root Beer infused ganache. All were wonderfully delightful. But, the chocolate that delivered the most extraordinary chocolate experience, we had ever had, was the Hazelnuts with Pop Rocks, a hazelnut praline with popping candy. This captivating chocolate kept zipping and popping in our mouths, making us giggle as the last traces of chocolate slipped away on our tongues. Just the idea of a brownie makes my pleasure receptors go into overload. There is something so basic in the simple bliss of biting into a rich, dense chocolate brownie and chasing it down with a glass of cold milk, or soy milk for the lactose intolerant. For some reason, I have never placed brownies into the connoisseur chocolate category. But just one bite of Sugardaddy's Sweeties, a Sugardaddy's trademarked Edgeless Brownie ® set me straight. Sugardaddy's Sweeties, so fresh they taste like they just came out of the oven, would make even the biggest chocolate food snob smile. Plus the presentation would please even the pickiest reality show chef, even a really mean one with a chip (chocolate of course) on his shoulder. Each brownie is a perfect, three inch, round, chocolate disk of pleasure, which is is why they are considered edgeless. (However, I need to point out that technically, they still have an edge, they just don't have corners but, I digress.) Each Brownie arrives with it's own case, to keep it from getting smushed. These cases are stacked and placed in either clear cellophane or elegant silk bags and they are always topped with an extravagant satin bow. This presentation makes them them perfect for gift giving. But, if you are a greedy chocoholic like me, you would have to channel the famous Peanuts comic strip where Lucy shares some candy with her brother Linus saying, "One for you, two for me" and buy a couple Sugardaddy's Sweeties for yourself each time you purchased one as a gift. This is the first Sugardaddy's Brunette Sumptuous Sweetie that I sampled because the candied piece of orange zest caught my eye. Like all of Sugardaddy's chocolate sweets, every bite has chunks of chocolate that give each brownie an amazing dense and creamy texture. There are bits of orange zest throughout this brownie but, the flavor is subtle and sophisticated, an intellectual brownie if you will. I am always a sucker for anything that looks like a sandwich and so the Rich Mint was next on the tasting plate. This Sugardaddy's Sweetie is an absolute must for anyone who loves Peppermint Patties; mint butter cream frosting sandwiched between the dark chocolate brownie layers. When I opened this package I was surprised at how beautiful this brownie was, with its rich swirls of raspberry. Just when I was about to dig in, several friends who have been showing up randomly at my house and hanging around on my porch since I started Chocolate Grail, rang the doorbell. When I invited them to taste test with me they all hastily agreed and this particular Sugardaddy's Sweetie was gone in seconds. If you're the kind of person who likes their classic brownie and no fancy fixin's, thank you very much, the Sugardaddy's Auburn Original has got your name on it. It's a classic brownie with perfectly toasted walnuts and what makes the brownie pack a punch -- a hit of espresso powder. Our photographer and world traveler extraordinaire, Ron Dunlap, doesn't like nuts and claimed the Auburn Original without nuts (shown below) after hearing the Auburn Original raves. Everyone was clamoring for the American Beauty next, which is the brownie featured at the top of the blog broken open to reveal an absolutely sinful creamy peanut butter center. This brownie is especially visually appealing, with bits of toasted peanuts on top. You just know by looking at it, that it's going to be good. There was barely time to photograph this particular brownie before it was devoured, but Ron still managed to do a masterful job! The Zanzibar (not shown) and Fiery (shown above), in Sugardaddy's Fire and Spice collection, were the last on the taste test and my personal favorites. What I liked is that they took the brownie into a new flavor dimension without losing any essential brownie-ness. The results were surprising and satisfying. The Sugardaddy Zanzibar Sweetie is the most exotic and sophisticated brownie I have ever had. It's a magical blend of clove, ancho chiles and dark and white chocolate chunks, and I could eat it all day, all week and into the 2011 New Year, the year of the Rabbit. The Sugardaddy's Fiery Sweetie focuses on heat. It borrows from the Aztec tradition of mixing hot chocolate with hot chili pepper so it delivers a rich, intense chocolate experience with a touch of burn. Hot Stuff! That's what I say! When I was a little girl growing up, my best friend's mom was known in our neighborhood for being a great cook and, more importantly to us kids, a great baker. The baked goods that came out of her oven were things of legend. Almost every day when we walked home from school (for miles, in the snow with no shoes on, if you must know) we could smell her cookies baking, the scent wafting through the air. This would make us all walk faster, and faster until we would break into a run, hair, lunch boxes (mine was Scooby Doo, although I would have preferred Aristocats) and book bags flying. There was something magical about her ability to transform the simplest, most wholesome ingredients: eggs, butter, flour, sugar, milk and vanilla into not just an ordinary cake, but something divine. Crixa Cakes, a Hungarian Bakery, has that same magic, wizardry that you can taste in the goods they bake each day, from scratch, in their store. Crixa Cakes is located on a wonderful tree-lined street and there is something fairy-tale-esque about the interior of the store. There are bakers bustling about, bags of flour on the counter, mixers mixing and bright colored copper pots hanging from the ceiling. And best of all the counters are piled full of cakes, cookies and pastries each more enticing than the next. It was hard to make a decision but we settled on the Pave Vergiate, a flourless chocolate cake that is rich and flavorful and the Soprano Tiramisu that blends what you love most in a Tiramisu with the perfect addition of a layer of dark chocolate mousse. But what makes both of these cakes so extraordinary is that they are so light and airy. So light and airy it is hard to believe one cake is flourless and the other a cream cake unless there is some magic being involved. The only thing that we regretted was not being able to sample every chocolate temptation: the Jamaican Rum Chocolate Mousse Cake, the Kiraly Raspberry Cream Cupcake, the Black Forest Cake, an intriguing Chocolate Mousse served in a white porcelain cup and the Rigo Jancsi Celebration cake, a cake created by a gypsy musician who won over the heart of a princess. I guess that means we're just going to have to return again and again to the magical kitchen of Crixa Cakes.